Click to enlarge these Google Earth images using the Time Slider feature to see how these fields have changed between June 2008 and September 2016. 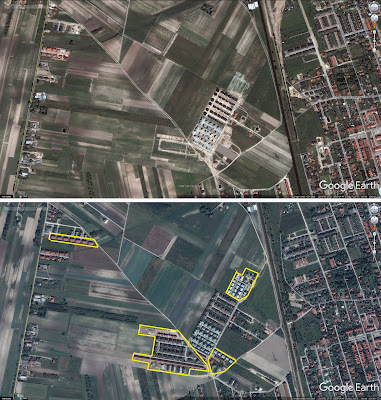 New housing outlined in yellow; since last September, more is appearing. 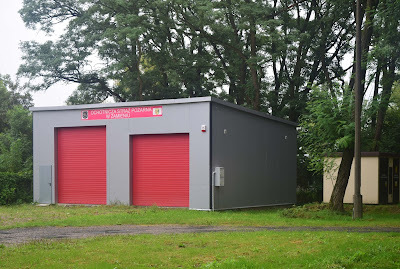 I'm finding this a rather inchoate community; on the one hand it's officially Zgorzała, on the other, there's no asphalt road connecting it to Zgorzała... the only asphalt in and out links this estate to Nowa Iwiczna. Neither ul. Przepiorki (connecting these houses to Zgorzała proper) nor ul. Gogolińska (connecting these houses to Jeziorki) are in any way passable to cars after a few days of rain. Everyone's expected to pass in and out by car along ul. Kielecka. Nowa Iwiczna station (Zone 2) is a one-kilometre walk away, with no pedestrian footpath short-cut. 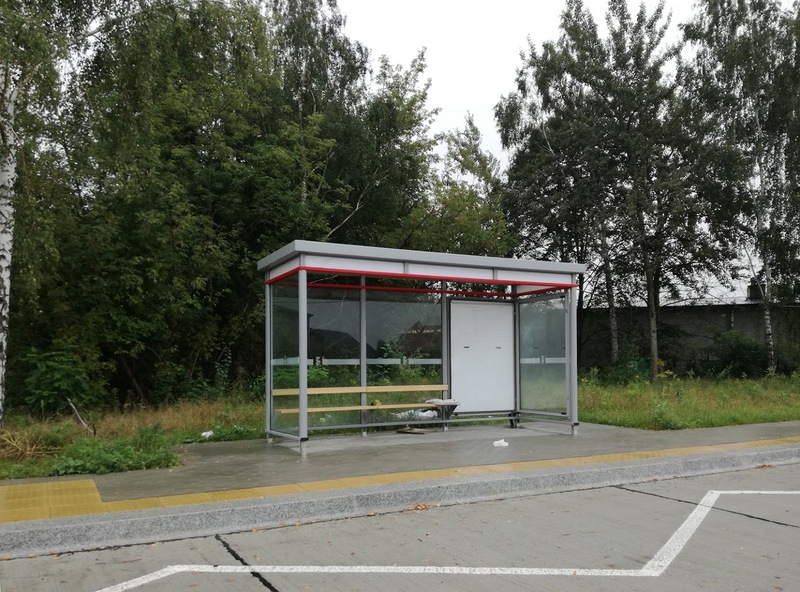 Another phantom bus shelter! Here in Zgorzała estate, across the way from the Lewiatan shop. No signage, no clue as to what buses will run to/from here and when. 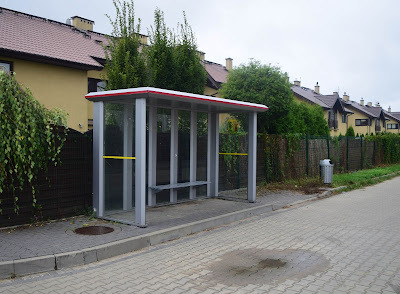 Phantom bus shelters are all the rage south of Warsaw's border: this one is by the new estate at Zamienie. Again, not an inkling as to when it becomes operational. Maybe it awaits the asphalting of Raszyńska/Złota, the road that links Podolszyn Nowy and Zgorzała by way of Zamienie. And another phantom bus shelter - this one in Dawidy. Like the one above, it was completed in May, you won't find anything official about it on the internet, only hearsay (alleged lack of planning permission). 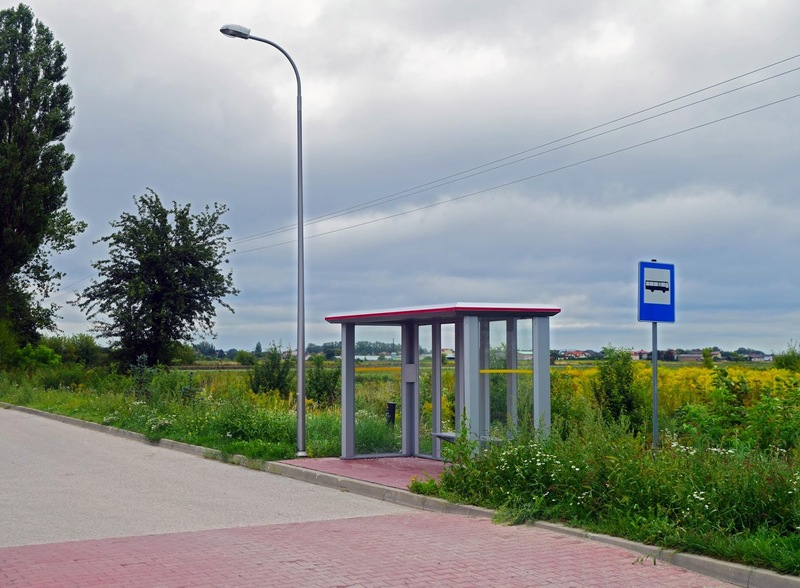 What bus routes will be using this new infrastructure? ...and here's the new one. A worthy investment, giving that hundreds of houses have sprung up around these parts in the last few years. Having said that, it won't be long before this fire station ends up on the wrong side of the S7, but that will be a while (and the expressway junction at Zamienie is not far anyway). And finally - I wrote last week about the new railway timetable (which comes into force today) and how this should mean the gated level crossing on ul. Baletowa by W-wa Dawidy will become operational. Not a bit of it. 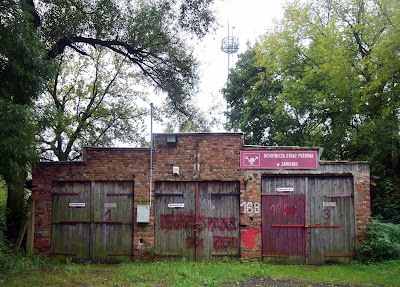 Today, as last week and for many months, the level crossing keeper's hut stands idle, no barriers. 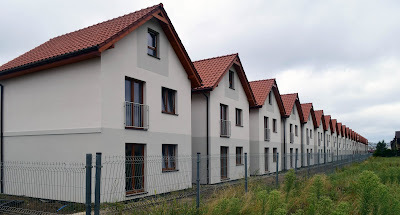 Suburbia comes to Poland. What boring, uninspired architecture. And the houses are so close together—why not just live in the city? And of course everyone will need a car to get anywhere. Yes, it is Suburbia and no they are not the most inspiring of designs but they are functional. They may be close together but they offer more space per zloty than living in the city together with the ability to be in the countryside in minutes. The train is becoming more usable off peak, on peak still needs more services though. Everyone needs a car regardless of where they live, people in the city have them so what is the difference? On the planning point, I do not know the area plan but the time to expand the options out from just Kielecka are closing in. Schools and other services seem a longer way off, Lewiatan only arrived very recently. PS I should of course declare that I live here and have done so since 2008. "Everyone needs a car regardless of where they live"—absolute rubbish. A car is not a necessity if you plan correctly. I live in a smaller Polish city, and have not had a car since moving from North America 15 years ago. I bought a flat where I can walk to the store, the city center, to work, and to the railway station. Problem solved. People have cars because they want them, not need them. And in Poland that "want"-mindset is growing. And the cars here are getting huge, too. At least when I first started visiting Poland the cars were little Ticos and Maluchs; now they are monsters. @ Agree with Anonymous to an extent - I'd argue that you don't need a car if you live within Warsaw's borders. Public transport is good and getting better, and the walks between home, bus stop, station, office and home are essential to maintain good health. 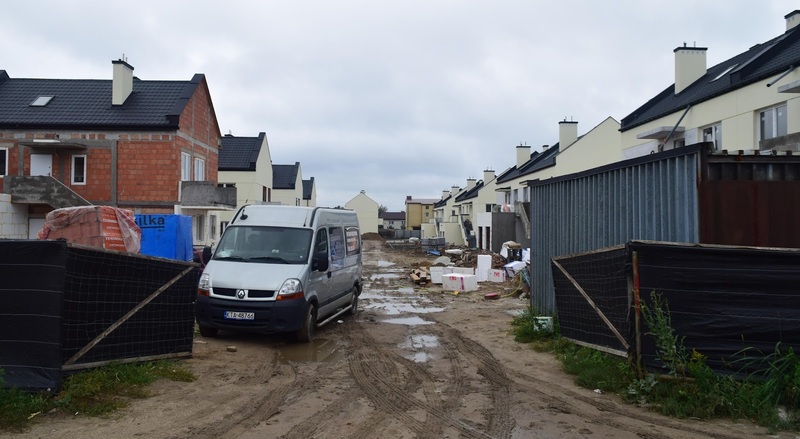 But out in the perimeter, where developers slap housing estates in the middle of fields paying no regard to public-transport links into town, things are harder. Car size - absolutely. It makes me laugh in the UK to see car parks, built in the 1960s and 70s, as shoppers try to stuff massive SUVs into spaces marked for Ford Escorts and Vauxhall Vivas. Ridiculous! I completely agree on the size of cars nowadays it is a problem. Re ownership, how do you get to your child's soccer practice etc., where there are no or very limited public transport options. You cannot spend an hour waiting for a connection, regardless of where you live. You can minimise use but you cannot eliminate it either. I do not now, but did coach American Football in my free time. Without a car I could not have made training, team meetings, sponsor meetings and a number of actual games by relying on public transport. Full-frame, mirrorless and interchangeable lens.